With the help of this Mac MBOX to HTML Converter software, it becomes very easy for the users to move MBOX to HTML format on Mac OS. The tool does not impose any file size limitation. 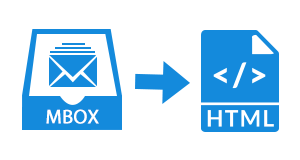 However, it generates multiple HTML files as output in which each file represents one single email from the MBOX file. 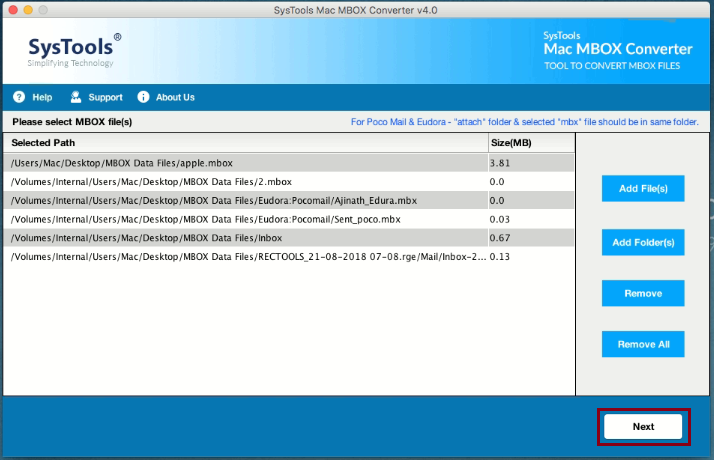 The MBOX to HTML Converter for Mac platform is designed in such a manner that it keeps the folder hierarchy, inline images, data integrity, and HTML formatting intact as original even after Mac MBOX file conversion. In addition, it preserves meta properties of emails also like to, cc, attachments, etc. Another impressive feature of this tool is that it allows users migrate multiple Mac MBOX file at once. 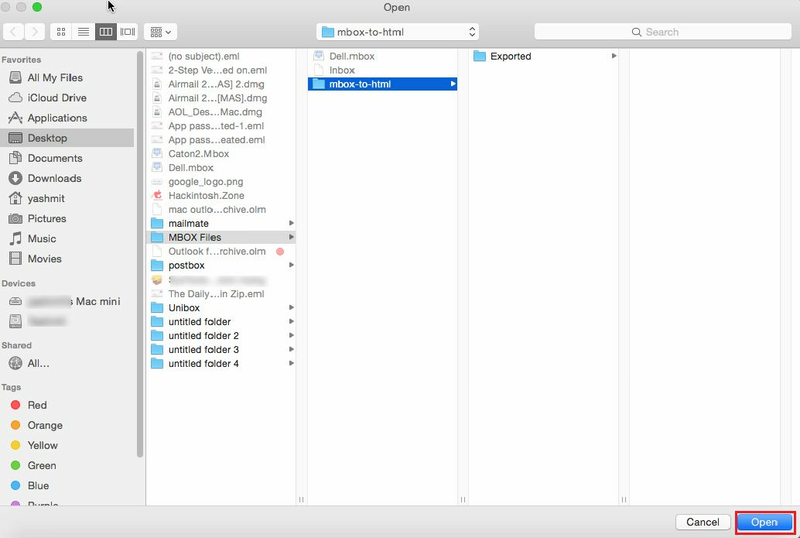 A user just needs to choose Add Folder option to load a complete folder containing multiple MBOX files in it. The tool will transfer all of them to HTML format in bulk without any restriction. 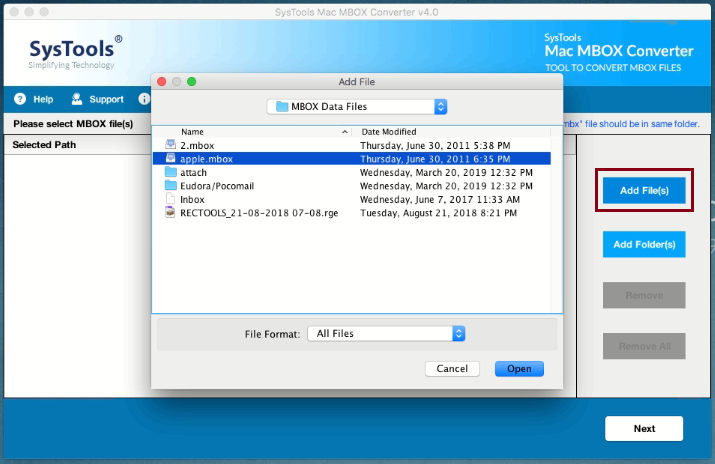 While converting Mac MBOX to HTML format the software provides users an option to save the output HTML file at any desired location. If a user wants can create new folder also to store all emails in HTML format. In addition, one can choose any of given naming convention like to, cc, subject, etc., to save the output file according to their convenience. 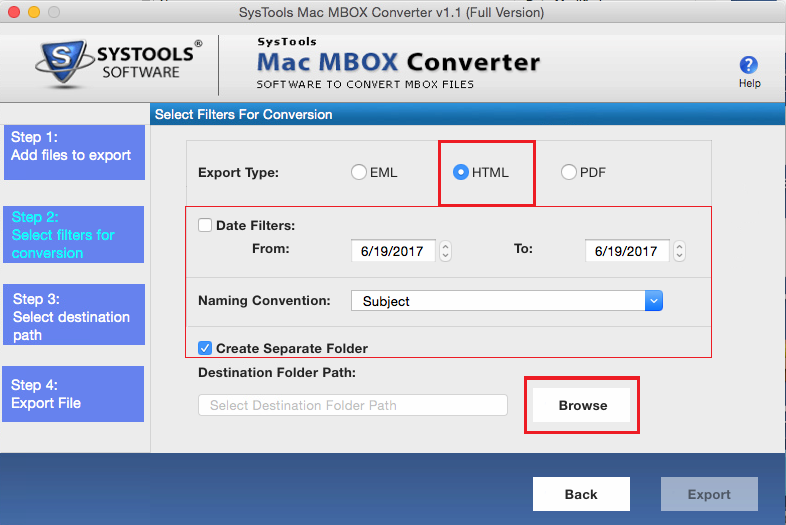 The MBOX to HTML Converter for Mac allows users to export selective Mac MBOX email to HTML format with the help of the date-based filter. A user just needs to specify the date range in ‘to' and ‘from' field and the tool will export the emails, which fall under that specified range only. 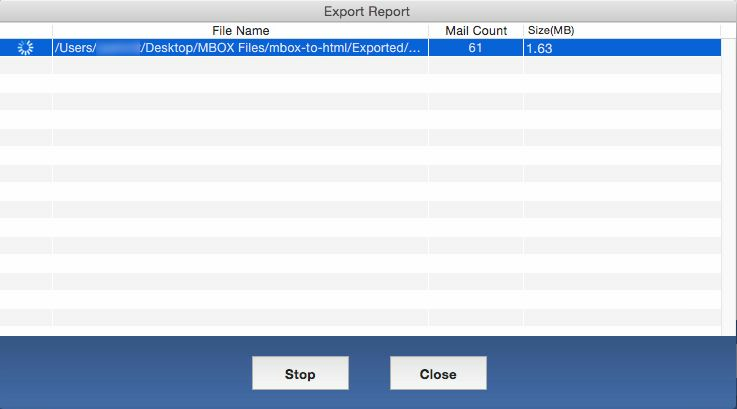 The Mac MBOX to HTML Exporter is the software that can easily be installed and launch on Mac OS X 10.10, and above version successfully without any limitation. In addition, the software supports all MBOX file created by Mac OS supporting email application like Apple Mail, Thunderbird, etc. Does the software maintain the integrity of data even after Mac MBOX to HTML conversion? Does the Mac MBOX to HTML Exporter require any extra installation to be launched on the Mac machine? No, the application does not require any extra installation to be launched on the Mac OSX machine. 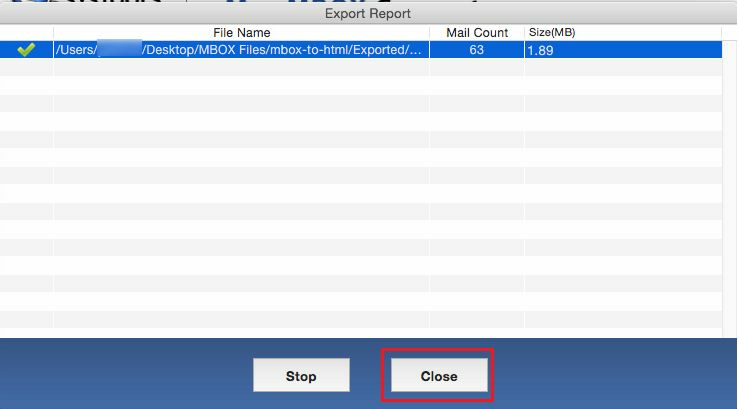 Is it possible to transfer selective emails from Mac MBOX to HTML format using this utility? Yes, the tool provides a date-based filter option to export selective emails from Mac MBOX to HTML format. One just need to specify the date range and the tool will export only that MBOX file item to HTML format. 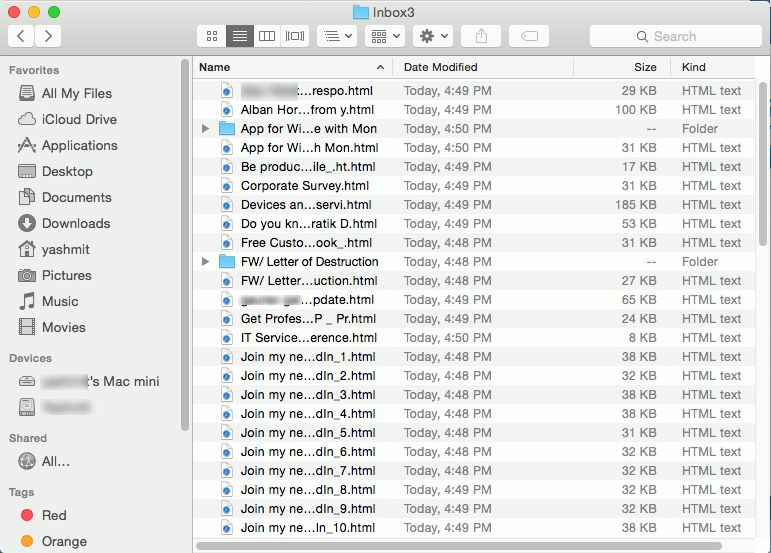 Can I save resultant HTML file using the subject of emails in Mac MBOX? Yes, the tool offers multiple naming conventions like by subject, to, cc, etc., while saving output HTML file. Can I run this application on Mac OSX 9.0 to convert MBOX to HTML format? No, the tool does not support Mac OSX 9.0. It is compatible with Mac OSX 10.10 & all above versions only. To add MBOX file, click on Add File(s) button. Date Filters: In order to export emails from specific date range, you can use this option. Maintain Folder Hierarchy: If you want to keep the data in same way, then check this option. Naming Convention: To save the resultant emails according to your choice, choose any of the desired naming convention. Go to selected destination location and view all the exported emails in HTML file format. "There is very less software available in the market that supports Mac platform. Therefore, it becomes difficult for me to find a tool that exports Mac MBOX to HTML format. 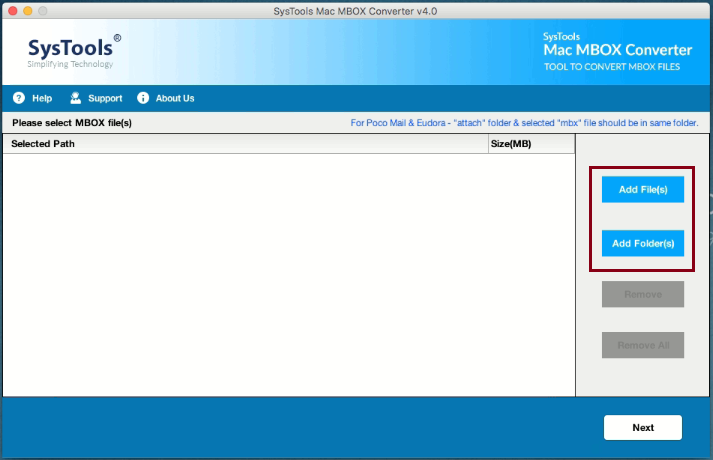 After a very long search, I came to know about this Mac MBOX to HTML Converter. I must say that it is an amazing utility with a very simple interface. I did not find any difficulty while using this tool. Hope to see some products like this by you in future." "I was looking for the software that allows me to export multiple Mac MBOX file to HTML format at once. Thanks to this MBOX to HTML Converter for Mac. It allows me to manage all HTML file in one single folder without any trouble."